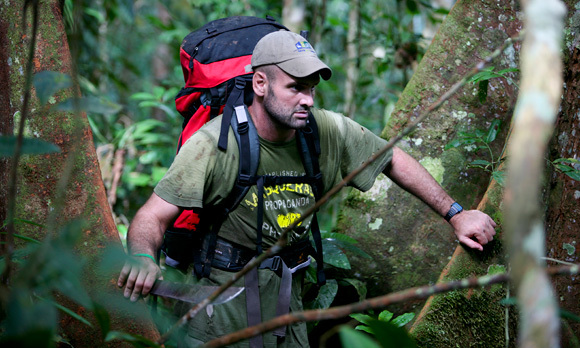 (P1) Ed Stafford from the UK is the first person to walk along the Amazon River from the mountains of Peru to the mouth of the river in Brazil. His amazing journey took two years and four months. There are many dangerous animals in the rainforest, like snakes and crocodiles. Ed was lucky because he was only bitten by ants and mosquitoes on his trip. Ed had to find fruit and nuts or catch fish each morning. Sometimes food was hard to find and Ed was often tired and hungry. (P2) Technology was very important for Ed. He used a radio to ask the people of the rainforest for food and help. Many people came to meet him and guide him through the rainforest. While he walked, Ed wrote a blog to tell the world about climate change and destruction of the rainforest. Would you walk along Amazon River? Why or why not? Do you like adventure? Why or why not? Describe an adventure you went on. Where is Mr. Stafford from? How long did it take him to complete his adventure?